Madhuca longifolia is an Indian tropical tree found largely in the central and north Indian plains and forests. It is commonly known as mahua, mahwa or Iluppai. 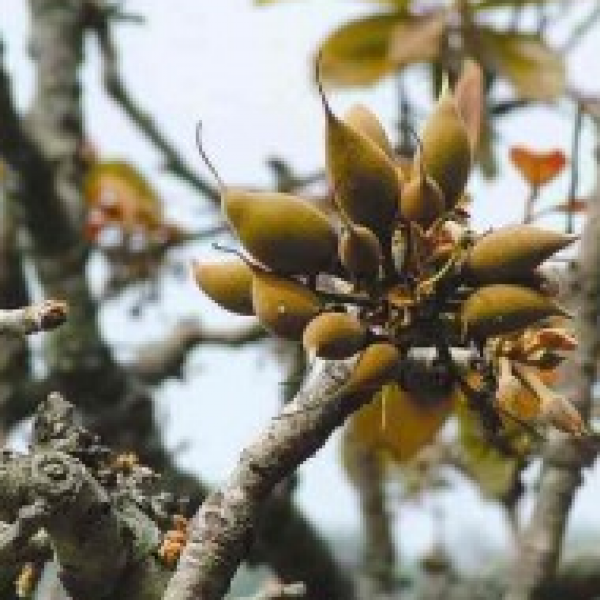 It is a fast-growing tree that grows to approximately 20 meters in height, possesses evergreen or semi-evergreen foliage, and belongs to the family Sapotaceae. It is adapted to arid environments, being a prominent tree in tropical mixed deciduous forests in India in the states of Chhattisgarh, Jharkhand, Uttar Pradesh, Bihar, Maharashtra, Madhya Pradesh, Kerala, Gujarat and Orissa. The tree is considered a boon by the tribals who are forest dwellers and keenly conserve this tree. However, conservation of this tree has been marginalized, as it is not favoured by nontribals. The leaves of Madhuca indica (= M. longifolia) are fed on by the moth Antheraea paphia, which produces tassar silk (tussah), a form of wild silk of commercial importance in India. The alkaloids in the press cake of Madhuca seeds is reportedly used in killing fishes in aquaculture ponds in some parts of India. The cake serves to fertilize the pond, which can be drained, sun dried, refilled with water and restocked with fish fingerlings.